A memorial service will be at 7 p.m. Saturday, May 16, 1998, in Clackamas Christian Center for Arland James Christ, who died May 4 at age 77. Mr. Christ was born Dec. 31, 1920, in Lebanon [OR]. He was a U.S. Army paratrooper during World War II and participated in the invasion of Normandy. He was a long-haul truck driver until 1957, when he became a heavy-equipment operator for Franz Bakery. He retired in 1987. He was a member of East Hill Foursquare Church in Gresham. He married Dora Stella Robinson in 1943. Survivors include his wife; son, Arland H. of Milaukie; daughters, Margie Goodman of Gresham and Dena Dunkin of Milwaukie; brother, Kenneth, and sisters, Leanora Fountain, Lucille and Lucinda Grace, all of Lebanon; 15 grandchildren; and eight great-grandchildren. Private interment will be in Willamette National Cemetery. The family suggests remembrances to Kenneth Copeland Ministries in Fort Worth, Texas. Arrangements are by Lincoln Willamette Funeral Directors. 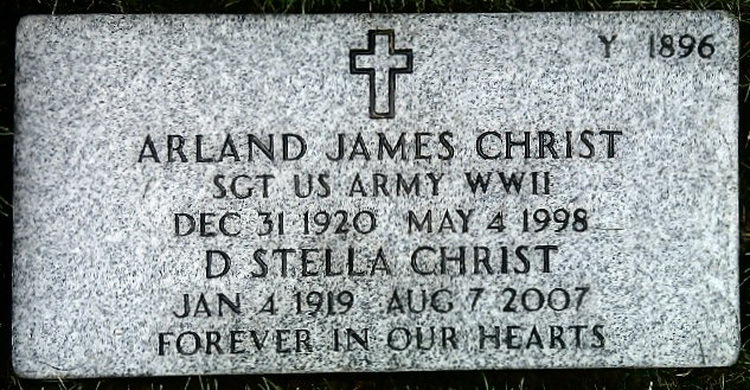 Grave marker for Arland J. Christ at Plot: Y, 0, 1896in the Willamette National Cemetery, Portland (Multnomah County), Oregon.